It's over two months later and I'm finally getting around to writing up something about Bali. Sorry Bali, you deserve better. I went during October holiday with a bunch of MBA friends, and while I'd originally been a bit iffy about signing up (it's just so touristy, you know? ), the place impressed me way way more than I thought it would. During the month of October, the threat of Mount Agung erupting was high-ish, but Bali tourism officials were still pulling a Mayor Vaughn and emphasizing real hard (almost too hard) that "Bali tourism is safe" and scolding us not to "spread misleading news that Bali is not safe because Mount Agung is on highest alert status." We joked that even if it wasn't safe, it wouldn't be that terrible to be forced to stay in Bali. Unfortunately/fortunately for us, Mount Agung stayed tame the whole vacation. Really unfortunately for Bali, it has been erupting in small to medium burps since November, just in time to massively depress the tourism economy. My fingers are crossed for all the folks there that the reduced seismic activity in December means that this was just Agung's once-in-a-lifetime acid reflux rather than a once-in-a-lifetime Exorcist-style hurling (especially since, actually, my brother and his family-in-law are there now). In the horrifying prospect of the latter case, I guess this post will become a "three things I remember fondly about the Bali that once was" story. Once again - fingers crossed. Bless. #PrayforBali. I'm leaving "eating" out of this post because I did it so much it deserves its own separate tribute. I swear I absolutely will put that up sometime before the year is ending. Maybe - omg it's already the last week of December? Where did the time fly to? You've probably heard before that October is in the midst of Monsoon season in the tropics, and therefore super rainy. You'd be right. For most of the four days our group was there, we were ducking between torrential downpours. And yet there was one activity where the rain not only didn't matter, it actually enhanced the majesty of the scenery - and that was white water rafting. Right before going to Bali, I'd gotten a copy of Uncharted: The Lost Legacy and was working my way through its gorgeous Indian jungle setting. When we began our hike down to the Ayung River, it was so much those same screenshot scenes in real life that I audibly gasped. And as we drifted down the (admittedly very easy to raft in) river, the gasps kept coming. There is this whole section there that's intricate carvings of an old Hindu love story: Ramayana and Sita. It's not old - apparently a hotel paid for it to be incorporated into the landscape just in the last decade - but it's still breathtaking. We traveled with Graha Adventure and I have absolutely no complaints - the people were professional, fun, and always let you know what you were supposed to be doing. Also, they had a photographer take DSLR snaps of you bouncing the entire way down the river... which were then uploadable to your phone (I love it when tourism locations know they ought to make Instagramming easy) for a shockingly small sum of money. Indonesia is known for being one of the great coffee exporters (Java anyone? Or that famous Cat Poop coffee? ), but it took a while for actual coffee culture to catch on. Now those local roasts are going to a burgeoning scene of local roasteries, ready and waiting to caffeinate the Indonesian middle class. Ubud is bursting with amazing brews. The one we especially went to try was Seniman Coffee, which not only has its own line of specialty beans and cold brews, but also does fun things upcycling plastic furniture. 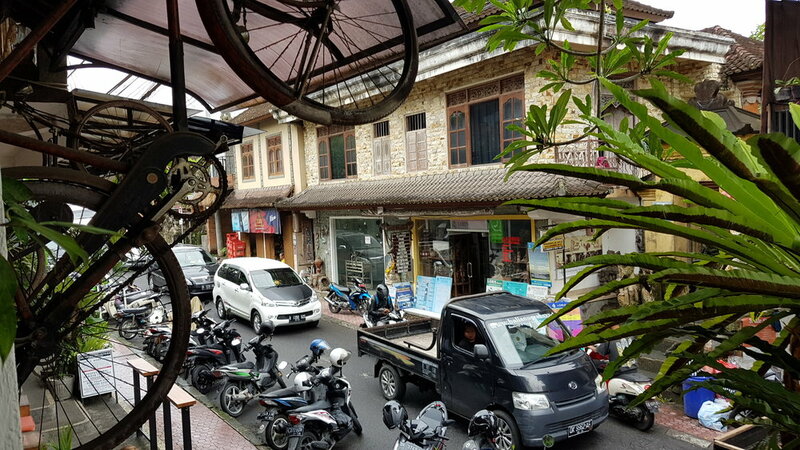 Unfortunately, just one of the cold brews quenched my coffee craving for the day, so I didn't get to try any of the other locations - but assuming Bali still exists in the future - I found this awesome list of cafes to try in Ubud. Right. It's a beach destination. But sometimes beach destinations are almost like they're on a mission to prove to you why they're so beloved by folks around the world. This is what a sunset looks like in Seminyak, after it's been raining all day. 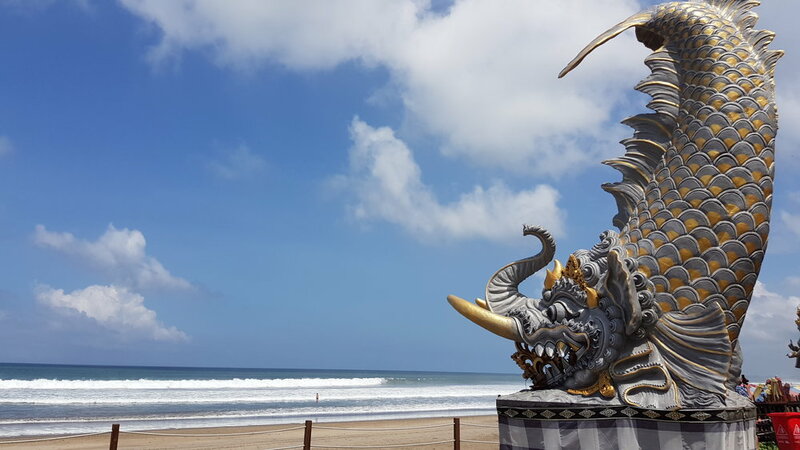 Seminyak, covered in an incredibly soft white sand and with slightly stronger waves during the monsoon season, is a more exclusive sibling to the super tourist destination of Kuta just south of it. On the beachfront, there are numerous little restaurants that lay out bean bag chairs for you to watch the sea from. At night, each restaurant has its own live music stage, and each live music stage seems to be contractually obligated to play Hotel California at least once. If you're lucky, your live music stage might venture out of well-trodden acoustic territory. Some friends and I definitely settled at one because they welcomed us in with a delightful rendition of Black Sabbath's Iron Man. To be honest, the food and drinks at most of these restaurants are middling. Of the various ones we tried, only one really stood out as particularly worth mentioning: La Plancha, which actually had a cocktail menu beyond the standard well drinks and shoddily made Singapore Slings (also, they had a great three-types-of-seafood calamari dish). And so if you aren't going to choose based on music selection alone, I'd recommend going there. Autumn is actually the season in which sea turtle eggs hatch, and there's one organization down in Kuta that lets you do the good work of ensuring, in an eco-friendly and environmentally responsible way, that these newly hatched sea turtle babes actually make it into the sea (a difficult endeavour now with things like traffic and bright lights). But since this is nature, you've got to luck into actually having hatchlings on the day to release. Alas I was not so lucky on my last day in Bali. Follow the Bali Sea Turtle Society on Facebook and every day, around noon, they'll let people know if there's a chance to volunteer. Now, to write up that food post.